This is a preliminary first impressions thread; I will be doing an in depth review later in time. I put it on the little back up board (PedalTrain PT Jr) (as shown) I normally have the Tech 21 FlyRig5 that has been holding down the backup rig spot for me; I added the Tech 21 Midi Mouse to change presets. 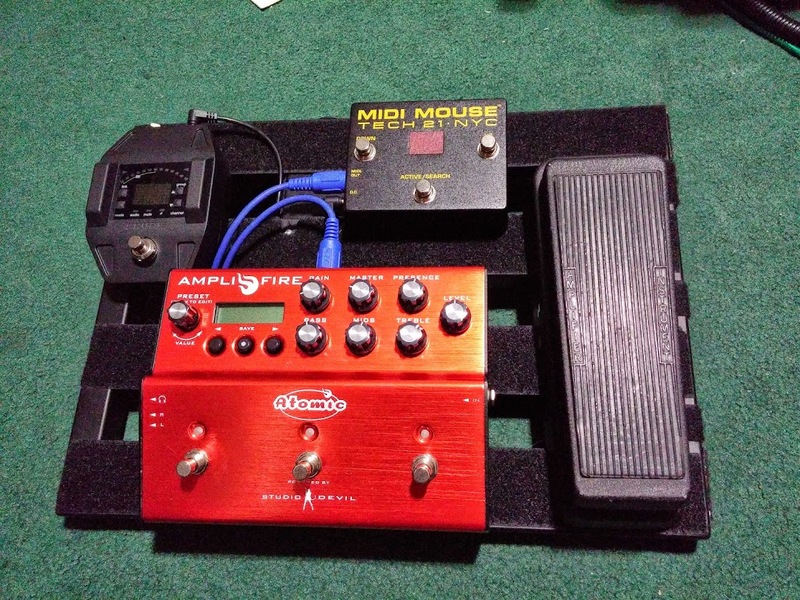 On this board I have the pedal form factor receiver for my GLXD; in my "A" rig I have the normal receiver on a rack try. I have to just link the transmitter to this receiver and it's good to go. This receiver is cool because it has a built in tuner to boot. So the Amplifier in my case will be vying for my small "B" rig; the "A" rig is a fully blown Axe-FX II with an MFC-101 and 4 expression pedals (three of them with midi switches). I use the "B" rig as a backup that I leave in the car at every gig/practice/rehearsal and also as an alternate 'grab-n-go' rig when the bigger, heavier "A" rig isn't the right tool for the job. My requirements for the "B" rig are that it is light, small, portable and can be dropped into the other parts of my "A" rig - use the Atomic CLR as a monitor, be able to interface directly to FOH. I am very particular, demanding and specific in what I require from any rig I use and the tones matter to me more than anything else. I have a lot of experience running direct-to-FOH rigs and have always carried a back up rig though I have (luckily) never needed one yet on a gig (knock on wood). The main advantage that attracted me to the Amplifire is that it would offer more choice and capability than the Tech 21 FlyRig5 offers. Now; there is *nothing* wrong with the FR5. It's been rock solid, I've used it at rehearsals and on some pickup gigs by choice. I still am attracted however to what the Amplifier can offer in that same slot in my overall rig though. To tweak anything without the editor beyond the amp block you have nested menus; though very fast to use here, they are nested menus which some people are almost allergic to. Impressive tones right out of the gate. It sounds good. It feels good. (I particularly like the Twin and Plexi; two of my mainstay real world base tones). Even just raw tones - no verb, no delay, just amp & cab - sound pro-level good. This is NOT a toy. IR loading is [I]great [/I]- editor makes this very simple and automatic; no tricky conversions or intimate file type of editing necessary. Editor available and easy to understand and use right from the jump. Being a modeling/digital product, love that I can backup/restore from the editor from day one. Given the stated development cycle updating is not stressful when you have a backup before you do an firmware upgrade (speaking from *lots* of experience here!). Having all the amp controls on the top of the pedal make dialing so fast and simple. Easy to see where the particular control is set via the easy to see and read display screen; but the screen is very small. Manual is easy to use and understand. Don't need an engineering degree or 'professional profiles' to get killer tones right from the jump; adding your own cab IR's is fast and makes for a quickly customized tone machine. I have extensive experience dealing with cab IR's (disclosure: beta tester for Red Wirez, Own Hammer and Fractal Audio) and the ability to add your own is truly worthy of note. For a brand new out-of-the-box product this is impressive. NO way around that. The promise it shows to further add amps and capabilities is great but you are not dependant on those promises to make this a serious value at a $600 price point. I've not seen a product yet that could not be improved. To hit the price point they have a small display screen, depend on a (simple) nested menu for any sorts of tweaking beyond the amp block. You do not need the editor to work with this, but it makes it very simple to do so. The editor is not long for pretty GUI stuff, but it is very functional. Straightforward, easy to understand without a manual. I was backing up and restoring, setting the function of the footswitches and working withing presets almost without blinking in minutes. The knobs make dialing stuff up very fast. Most of the routing possibilities are 'pre' or 'post' the amp block; pretty straightforward and easy to understand. The effects are workingman's tools - they are there, if you don't have a midi controller to turn things on/off then you'd be best setup to just do presets as you need. The three switches can be setup to do most anything on/off you want or tap tempo. To fully get working with this I highly recommend using at least some sort of midi switcher to change presets. The Tech 21 Midi Mouse works great right out of the box, no configuration necessary. Plugged it in and it worked. Done. It takes my Joe Gagan wah wonderfully. I am testing a very fully blown effects pedal (more to come on that separately; NDA at this point) from a different company and it works with THAT wonderfully. The key to any modeling product that does amp tones are... the amp tones. I have been running a FRFR direct-to-FOH rig since 2007 and dropping this in front of my studio setup or Atomic CLR works GREAT. The acid test is gigging the gear though. That is coming. Clips, video, etc.. to come. Great value, pro-level tones, fast and easy to dial, nice and sturdy yet light, good balance of capabilities vs. price point; editor is straightforward and practical. It's always interesting to get something you have zero experience with and see how quickly you can get inside of it and understand how to get the tones you need/want from it. They struck an impressive balance of value for money and adding the cab IR loading is a stroke of genius that lives up to the billing. At this point - very early in the game - I am impressed and happy. I love and enjoy my "A" rig and adding serious versatility and power to my "B" rig is a luxury more than a necessity for me; but it is welcome and I'm digging it so far. I will be doing a much deeper look at this in the weeks, months moving forward and will be reviewing this in the real world from a workingman's gigging perspective.